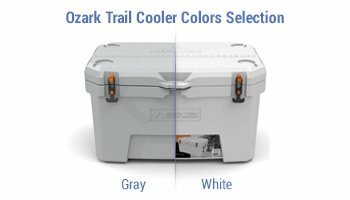 Have you ever heard of the Ozark Trail line of coolers? Well, we are always hunting for new cooler brands to review. So imagine our joy when we stumbled upon this little gem of a brand. So here we are with an Ozark Trail cooler review. The Ozark Trail cooler brand is sold mostly in Walmart stores. Now, the general assumption here is that this cooler brand is actually owned by Walmart since they’re mostly sold at their stores. However, we cannot definitely say whether Ozark Trail is a Walmart company or not. It looks as a private label brand of Walmart but you can also get the coolers on Amazon anyway so we are not really confined to buying them in one place. What we can definitively speak about is the main motivation behind it. See, there are two kinds of cooler brands in the market, for the most part. There are cooler brands that focus on coming up with premium features for their customers, and there are cooler brands that focus on coming up with affordable coolers for the average Joe. Unfortunately, these two groups of brands seem to be mutually exclusive at the moment. You’re either looking for a premium cooler or you’re looking for an affordable cooler. Isn’t that just a little sad? We’d like to think the good people behind Ozark Trail thought this was sad indeed. However, rather than bemoan the situation, they decided to do something about it. 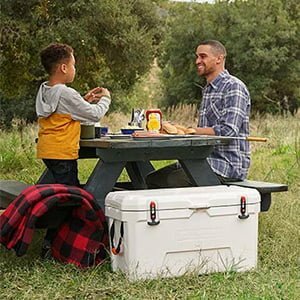 In the great spirit of American entrepreneurship, they came up with a line of coolers that have a bunch of premium features but are also affordable. How on earth they manage to make a profit with it is beyond us for now. We suspect a good amount of overseas outsourcing is behind it. But hey, we’re certainly not complaining! If getting a great cooler at a great price means making some sacrifices, like not having it made locally, we know there are people who are willing to pay that price. So there you have it. 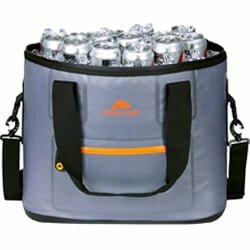 We have the Ozark Trail line of coolers. They also have some great but more mainstream designs for the tightest of budgets, by the way. Looks like they seem to be focused on the medium to lower price range when it comes to their customers and certainly seem to be doing a great job of it. So let’s jump right into the review and see what’s to love about this brand! There are 3 main coolers under this brand. 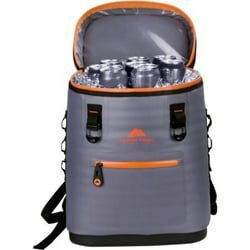 We have the hard coolers under the Ozark Trail high-performance line of coolers, then we have the 36-can Jumbo soft cooler, and finally the backpack cooler for the more mobile among us. We’re going to review each of them in turn. There are 3 main sizes offered in this category. We have the 26-quart cooler, the 52-quart cooler, and the 73-quart cooler. 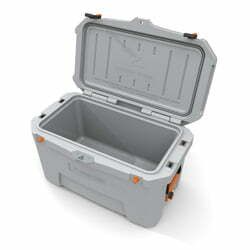 When it comes to the handles, they have followed the same kind of pattern you see in other types of coolers. In the smaller cooler, the 26-quart one, the handle is overhead. 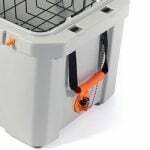 However, that kind of handle won’t work for the larger coolers, so they utilize side handles made of rope for those ones. It might seem a little disappointing that there are only 3 sizes to go on, but at least they went for the most common sizes used by people. Basically, you have a small cooler, you have a medium cooler, and you also have a fairly large cooler. The only group that isn’t served here is the group of people looking for coolers over 100 quarts in capacity. 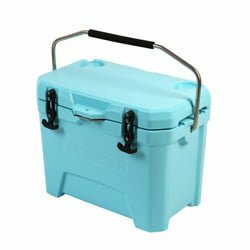 These are the best coolers when you want to store items for the entire family, like when you have a large family event coming up, or when you’re going to be gone on an excursion for like a week. 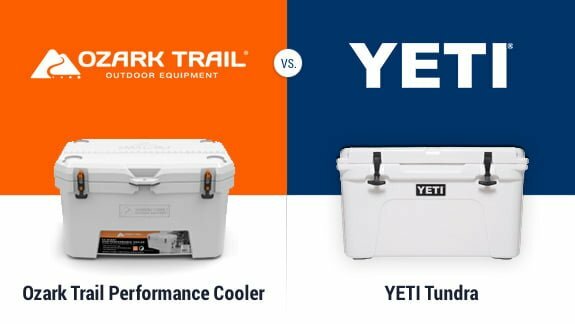 The way the Ozark Trail hard coolers are designed, they are supposed to compete with the very best cooler brands in the market at the moment. That pretty much means they have a lot of hype to live up to. The million dollar question is: can they? 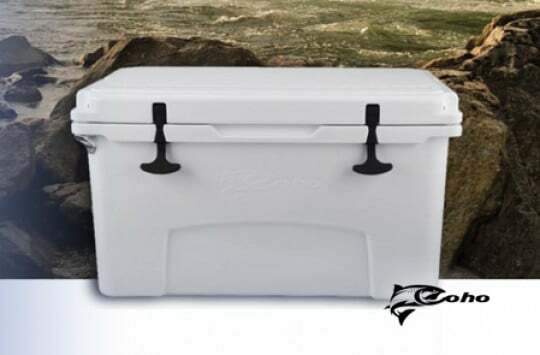 Ozark Trail decided to pass up the opportunity to create a simple cooler for the medium price range to the lower price range. 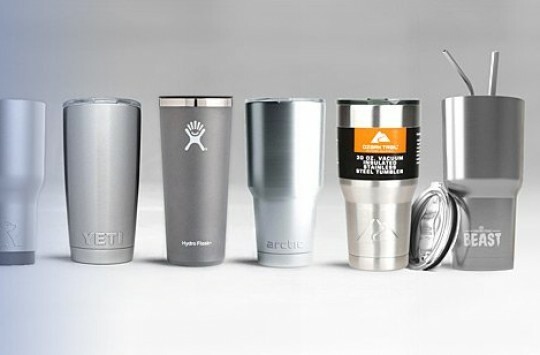 Instead, they decided to go for the kind of features you see in brands like Engel, RTIC, and the king of them all: Yeti. They also tried to do that while charging you a fraction of the prices these cooler brands charge you. If you’re going to create a top tier cooler, it obviously has to be rotomolded. That means it’s constructed in a single, seamless piece. 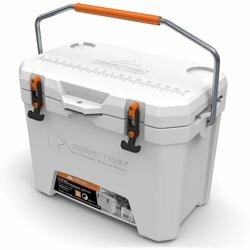 If you want your cooler to be both tough and durable, you can’t skimp on this one aspect of design. There’s a tick on that little detail on Ozark’s part because their coolers are, in fact, rotomolded. 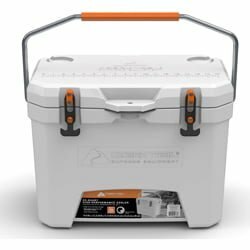 The thickness of the walls varies depending on the specific size you’re considering, but they range between two and a half inches and three inches in thickness – and this is pretty solid insulation, in line with the industry average for premium coolers. The walls also have a UV-resistant, coating that protects the cooler from eventual damage by continued exposure to the sun. Another thing you want in a premium cooler is the ability to hold ice for extended periods. That means you need a thick and high-quality rubber gasket. Ozark have a freezer-grade gasket that’s pretty much like what you would see in your average high-end cooler. So you have a strong gasket, but you need it to squeeze very tight if it’s going to be useful. That’s where a pair of strong latches comes in. 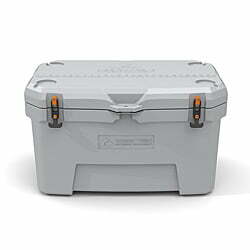 In this case, the most popular latch design among premium coolers is the T-Rex Latch design. That’s exactly what you find on the Ozark Trail coolers. There is a little bit of difference, however: For most designs, the base of the latch is what attaches to the pin. Ozark decided to be a little different here and instead installed a hole that attaches to the pin. It’s not a functional difference, however, since it’s still just as tight. Another good thing about Ozark Trail coolers is that all of their metal components are made of stainless steel, which is resistant to both breaking and corrosion. That makes them longer lasting. 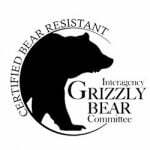 Because of this, their coolers are certified bear-resistant by the Interagency Grizzly Bear Committee (IGBC) and join the club of other well known, bear-proof coolers. That means you don’t have to worry about a grizzly bear gaining access to your cooler contents. Now we’re starting to go deeper into the features that actually make this cooler convenient to use. The drain is oversized, which means you don’t have to wait extra-long to drain out that melted ice. It’s threaded too, which means you can screw it on tight and it’s also attached to a chain, which means you don’t have to worry about losing it. Next, we have the anti-skid feet, which protect your tabletop from your super-heavy cooler. Even so, try not to drag it around if you don’t want to ruin the paint job on your truck bed or the excellent finish on your floor. 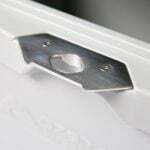 Right at the center of the base of every Ozark Trail Cooler, you will find a stainless steel locking plate. It also happens to serve as a bottle opener. So you get to secure your cooler when you’re not around and also open bottles with it when you are! Yet another feature you find on premium coolers: a molded fish ruler. It’s right on the lid, where you can measure the size of your catch if you’re a fisherman. You will also find molded drink holders on all the coolers. There are two on the small one and 4 on the medium and large ones. On the inside of the larger coolers, you will find a wire basket. This is a plus, considering many brands actually charge you extra for the wire basket. Ozark also put in some thought on the comfort with which you carry your cooler. You expect a premium cooler to be heavy, so the way in which the handle is designed is pretty important. For the smaller 26-quart hard cooler, there is an overhead handle. For the larger ones, you have side handles for a more comfortable haul. We still think they would do even better if they put wheels on the very largest cooler. Here the ice retention is pretty impressive if Ozark’s own numbers are to be believed. The smallest hard-sided cooler is supposed to last 4.5 days, the 52-quart one is supposed to last 7 days, and the largest one is supposed to last 9 days. These are in line with the industry standards so we give them a plus on that too, but of course, we’re going to run them through our own ice retention tests very soon (and we’ll update this post shortly with results). These hard-sided coolers actually look pretty cool. They have attractive features and sharp edges which all but catch the eye. There are orange accents on the latches and handles which definitely give them a premium look. In terms of color options, however, you only get silver and white. 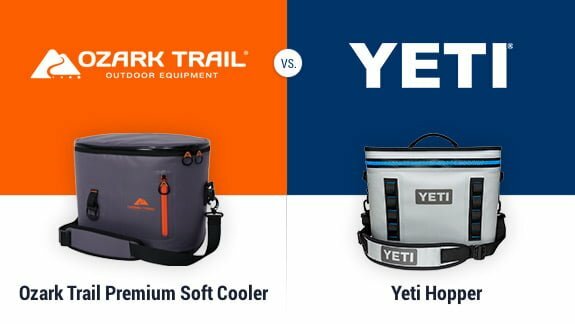 We know how premium Yeti Tundra coolers are, so the question is whether Ozark Trail coolers can match up. To be entirely honest, while Ozark tries, the ice retention isn’t quite on the same level as what you get with a Yeti. Neither is the toughness. The features are on par, however, and that is a plus. Here it’s really a battle of reputations, though, because, for the price, Ozark is a solid choice. Yeti is an industry leader, so there will always be die-hard fans who don’t mind paying an arm and a leg for a Yeti product. However, if you’re on a tight budget and want something that’s pretty good for the price, then you can’t really go wrong with Ozark Trail. The hard coolers from this brand are built to be on par with the most premium brands. The soft coolers are a little more down to earth. There are both premium and low-cost models. Whichever you go for, you will enjoy the numerous storage options you get. 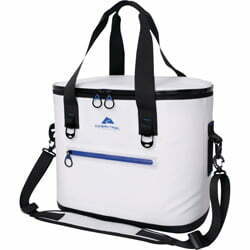 There is a large insulated area in all of the soft coolers and also plenty of pockets, both on the front and the sides. The pockets on the front have a zipper while the side ones are mesh pockets. Most of the models also come with an expandable top, which means you get plenty of storage space, being able to gain an extra three inches off the top. As for mobility, you also get a shoulder strap with plenty of padding. You even get an extendable telescoping handle with the 42-can model. The Backpack cooler on its part has some pretty comfortable straps for your shoulders. 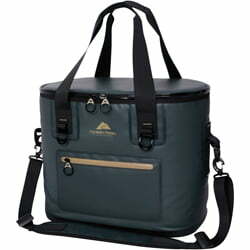 The tote comes with both a removable shoulder strap and overhead carrying handles. 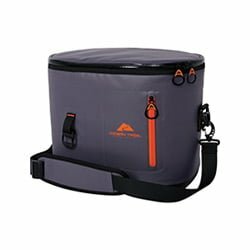 Most soft coolers from this provider have a removable hard liner while the backpack cooler and the tote bag have an EVA compression molded base. 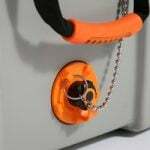 They also have daisy chain attachment points, built-in bottle openers, thicker insulation, a compression strap and a 600 denier outer coating that’s easy to wash. 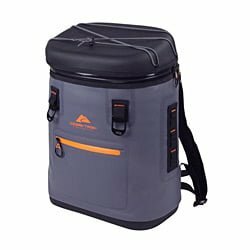 The Backpack cooler should be able to hold ice for a day while the tote holds ice for 1 and a half days. 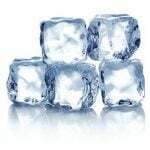 The lower end coolers are mostly designed to retain ice for several hours at best. That makes them only for lunch or a picnic. Here it depends on what you’re going for. 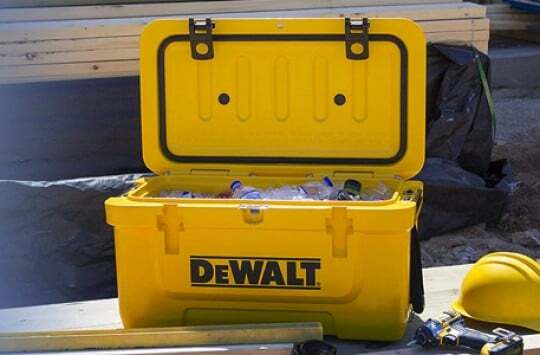 The non-premium soft coolers have solid colors that are considered ‘safe’ in the industry. Colors like green, blue, black and red abound. For the more premium soft coolers, you will get a bit more dynamism. You will see some white and grey here and there. Unfortunately, however, you won’t be getting much choice in terms of color. 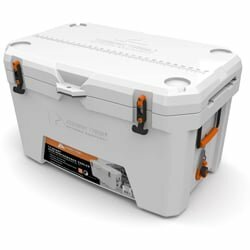 You also don’t get too many options to customize your cooler with a decal or a custom color or something like that unless you opt for a third-party accessory. When it comes to the soft coolers, the premium ones aren’t quite as close in performance to the Yeti Hopper as their hard sided counterparts are to the Tundra. They do match them in performance, however. The less premium Ozark soft coolers are just that: less premium. 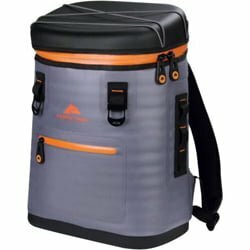 Again, here it all depends on whether you can afford the Yeti and are a die-hard fan or you are on a budget and are willing to try something new. In that case, the Ozark is for you. 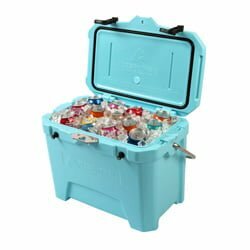 Ozark Trail Coolers for Sale – Where To Buy? You can buy these coolers at Walmart for the most part, which is good, but you can also get them on Amazon, which is better. We think it’s a good idea to check if they’re live on Amazon – they were at the time we’ve launched this post. On Amazon you also get perks like free shipping under certain circumstances, not to mention you get to read reviews by real customers before you make your decision. And with that, we conclude our Ozark Trail cooler review. As you can see, they do a pretty good job and certainly deserve your consideration the next time you’re out looking for a cooler. The next time you want a premium cooler and have to stick to a tight budget, try an Ozark. You’ll probably love your decision.